Something BLINDINGLY OBVIOUS occurred to me today. The Labyrinth is overtly feminist. If you haven’t seen this 1986 fantasy wonder film, stop right now and get onto it (you are literally committing a crime to your brain otherwise). Spoilers ahead, so seriously go rent that thing now! My feminist realisation is a lot overdue, given that I watched this film probably every week of my childhood. Sure, I noted the whole, “you have no power over me” thing, but I always took a very vague feminist reading – that it was simply Sarah’s (played by Jennifer Connelly) affirmation that she is a strong woman that controls her own destiny. Today while riding my bike home, for no apparent reason I suddenly thought, wait a minute, that whole darn thing is a feminist parable! I’m really far behind the times with this one (see here for an excellent feminist de-construction). This film is quite literally the opposite of any James Bond (on that note, see Judith Halberstam’s queer reading of Austin Powers here). Jareth (played by a spunky David Bowie) says to Sarah at the end, “I have reordered time, I have turned the world upside down, and I have done it all for you”. But Sarah doesn’t stand for it. 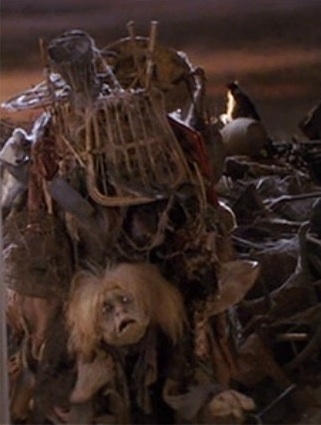 Jareth may have given Sarah all of the material things in the world (as apparent in the scene with the trash lady) and will even give her “the child” she seeks if she gives into his demands- but she doesn’t owe him anything, she’s a free woman! And she does get the child she wants anyway (a metaphor for the possibilities of single parenting?). The film also sees Sarah become the belle of the ball, the fantasy Cinderella, but she pulls that apart too- she wants something more in life. So, if Jareth and his goblin-man-kingdom represents the patriarchy (who knew oppression could be so hot and androgynous in lycra! ), Sarah sure does smash that thing down. But then I started to worry, what about the very end of the film? Sarah might not need a man, but she does need her friends- what to make of this new form of codependency? Perhaps problematically, Sarah’s friends are all male. But then again, Hoggle is not your typical hero-man (he’s ugly and well, gross), Sir Didymus is an effeminate fox, and Ludo is actually pretty non-gendered apart from the masculine beast voice (and everyone’s reference to him as a he). They might be a rag tag bunch, but clearly the end of the film doesn’t leave Sarah as an independent woman. Adding to my concern is Sarah’s loathing for her step mother (cos step mothers are evil, duh), and the use of Jareth turning into an owl- a symbol of protection and intelligence. Nevertheless, I still love this film, and can’t help thinking that it pre-wired some feminist questions in my brain that have probably significantly affected the way I see the world. Plus David Bowie is ten kinds of awesome, and I’m sure, a feminist too. 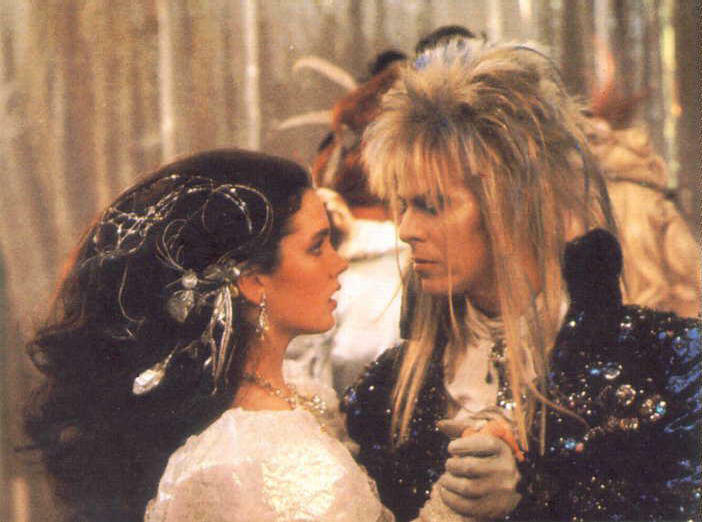 This entry was posted in Feminism, Film, Gender, Pop Culture, Reviews and tagged critical reading, David Bowie, Jennifer Connelly, Jim Henson, labyrinth by binarythis. Bookmark the permalink.